Sara Zollo, a 31-year-old financial advisor with Sara Zollo Financial Solutions Inc. in Richmond Hill, Ont., attributes much of her “growing up” to spending her formative years on the job as an advisor. 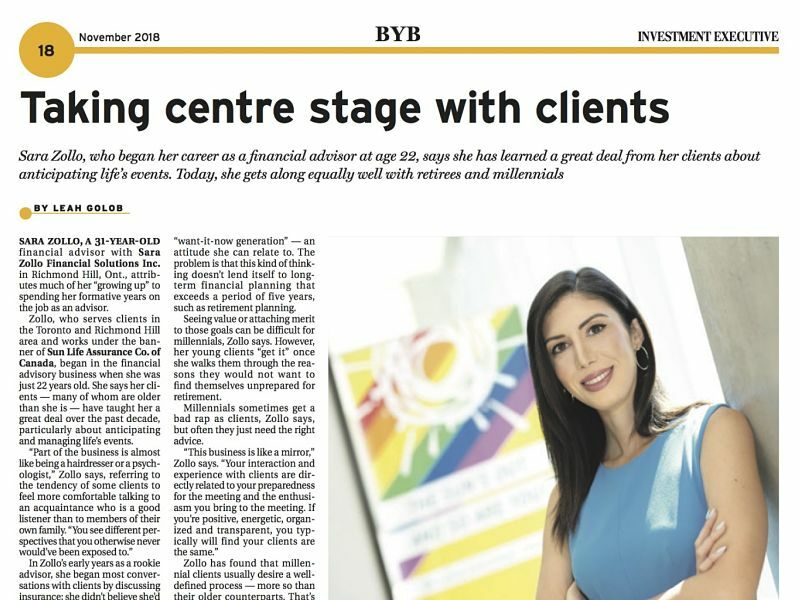 Zollo, who serves clients in the Toronto and Richmond Hill area and works under the banner of Sun Life Assurance Co. of Canada, began in the financial advisory business when she was just 22 years old. She says her clients – many of whom are older than she is – have taught her a great deal over the past decade, particularly about anticipating and managing life’s events. In Zollo’s early years as a rookie advisor, she began most conversations with clients by discussing insurance; she didn’t believe she’d be taken seriously as a wealth-management advisor at such a young age. As Zollo has matured, however, so has her business. Now, she begins her meetings with new clients by discussing wealth management, then follows that with insurance recommendations. As a result of this change in strategy, Zollo plans to set a minimum level of $250,000 in investible assets for new clients. She anticipates the demographic mix of her practice, which appeals to both young and older clients, will remain the same. Her roster is divided equally between millennials and young entrepreneurs on the young side and retirees and pre-retirees on the older side. “Retirees and pre-retirees want a younger advisor they can [have] confidence in and who will be maintaining a relationship with them over the next 20 to 30 years,” Zollo says. For those clients, having an advisor who can build, execute and monitor a financial plan for them is important. Older clients don’t always have the same sense of security with an older advisor: they want to be confident that their advisor will outlive them. Although Zollo’s younger clients don’t have the same level of investible assets as her older clients do, she regards millennials as the “next wave” – a demographic group who are set to receive a large wealth transfer in the coming years. Zollo fares well with younger clients because as a young businessperson, she understands their concerns. Milliennials, she says, are known as the “want-it-now generation” – an attitude she can relate to. The problem is that this kind of thinking doesn’t lend itself to long-term financial planning that exceeds a period of five years, such as retirement planning. Seeing value or attaching merit to those goals can be difficult for millennials, Zollo says. However, her young clients “get it” once she walks them through the reasons they would not want to find themselves unprepared for retirement. Millennials sometimes get a bad rap as clients, Zollo says, but often they just need the right advice. Zollo has found that millennial clients usually desire a well-defined process – more so than their older counterparts. That’s because older clients primarily are looking to build trust with an advisor, she says. Conversely, younger clients come into meetings having done a lot of research and with preconceived ideas. Younger clients will question your process a lot more, Zollo says, which is why you must show that your practice runs like a well-oiled machine. Part of demonstrating your ability as an advisor to milliennials means arranging for face-to-face contact as soon as possible. Some advisors assume millennials don’t want as much personal contact as older clients, but that’s not true, Zollo says. Although millennials are known as a digitally savvy generation, too much interaction via digital media won’t demonstrate that you are valuable to those clients as an advisor. When Zollo began building her business, she avoided cold-calling or knocking on doors; instead, she spent part of her time speaking with doctors and nurses at hospitals and set up booths in hospital concourses to discuss health insurance with prospective clients. She also tended booths at trade shows of interest to young families, such as home shows and baby shows. Because the likelihood of these chronic illnesses occurring increases with age, Zollo strongly recommends to clients in their 30s that they buy CI before they reach the age at which most people begin to rely on these products. Although serious illness is at the back of many young peoples’ minds – especially those who have watched older family members go through difficult illnesses – it’s seldom a topic that’s brought up under normal circumstances. Zollo has found that most clients are receptive to and appreciative of a conversation about CI. Although Zollo has found her calling, working in financial services wasn’t always in her plans. Before entering the financial services sector, Zollo earned a bachelor of arts degree in music at Wilfred Laurier University in Waterloo, Ont. She studied classical opera and trained as a soprano singer, although she doesn’t sing much now. The absence of a degree in finance or business hasn’t been a hindrance, Zollo says, partly because she earned as many designations as possible early in her career. She holds the certified financial panner, chartered life underwriter and certified health insurance specialist designations. Still, she believes training and credentials are only part of the story. Zollo’s performing arts background also helps her in numerous appearances on media outlets such as BNN Bloomberg, CTV and Rogers Daytime. Her experience as a performer helps her maintain a confident presence during live interviews for which she may have little time to prepare. Although television appearances do attract a few clients, the greater benefit to this exposure is that it bolsters Zollo’s reputation as an expert. “I think it adds credibility for our existing clients as well,” she says. Today, most of Zollo’s new business comes from referrals and the occasional seminar. She benefits from developing circles of influence through Business Networking International and its BNI Bloor West chapter. Through this networking, members from various professions work to build reciprocal referral relationships with one another. Zollo lives in Toronto with her partner, Tony. She enjoys city life, considers herself a “foodie” and travels to Europe every other year. Zollo’s goal for the next 10 years is to be less “married to the business” and create a stronger work/life balance.